Product: Red Bull's portfolio consists of 4 different products - Energy Drink, Sugar Free, Cola and Energy Shot. In the Singapore market, Red Bull currently only provides the Energy Drink and Sugar Free product. Promotions: Red Bull's promotional efforts include the use of celebrity endorsements, Red Bull Girls who act as ambassadors, and as event sponsors for major sporting events. 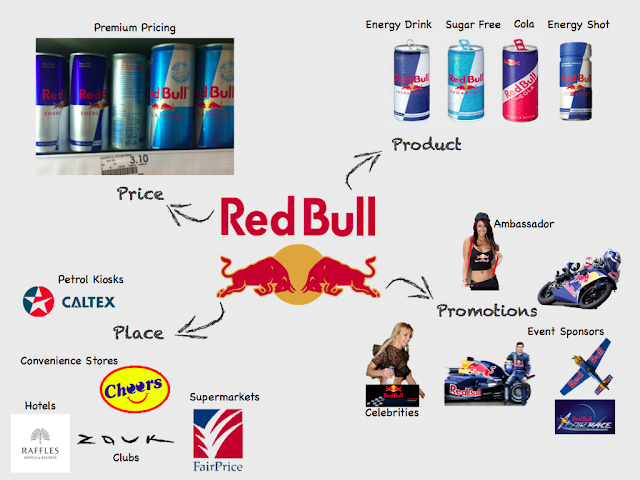 Price: Premium pricing is employed by Red Bull, prices of its products are priced at $3.10 on average. Place: Red Bull products are distributed through petrol kiosks, convenience stores, supermarkets, clubs and hotels.